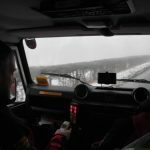 Following further heavy snow fall, the Team was paged by the police and asked to transport our (now regular!) 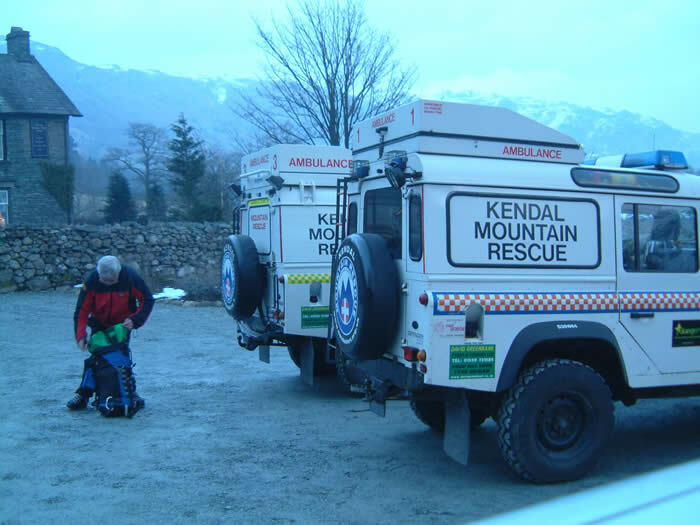 man from Dent to attend the Westmorland General Hospital in Kendal for dialysis. No problem – happy to help! The Team was requested to assist in moving an elderly lady who was feeling ill. Two team members attended the property in Grange-over-Sands where they met an ambulance crew on scene. 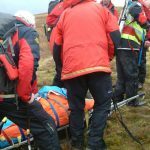 Between them the lady was transferred into a team Land Rover and then taken down a steep ungritted hill to the waiting ambulance for onward transport to hospital. A local reporter from BBC Radio Cumbria recorded the incident and it went out on local radio about an hour later. 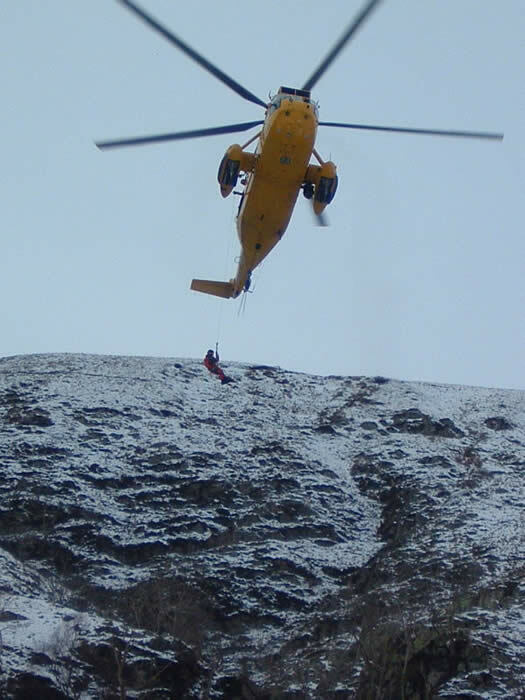 The Team was asked to transport an elderly lady from Crook to a care home in Staveley during the bad weather. 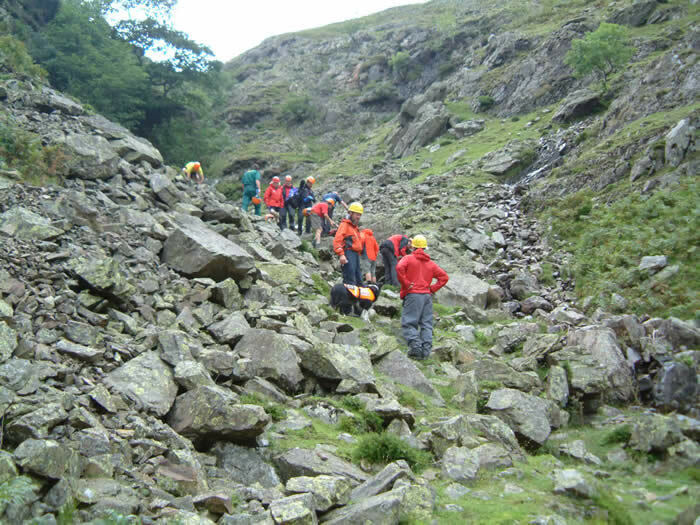 We were asked to assist the Langdale & Ambleside Team in evacuating a casualty from Crinkle Crags. One of a small party had slipped and sustained a wrist injury. 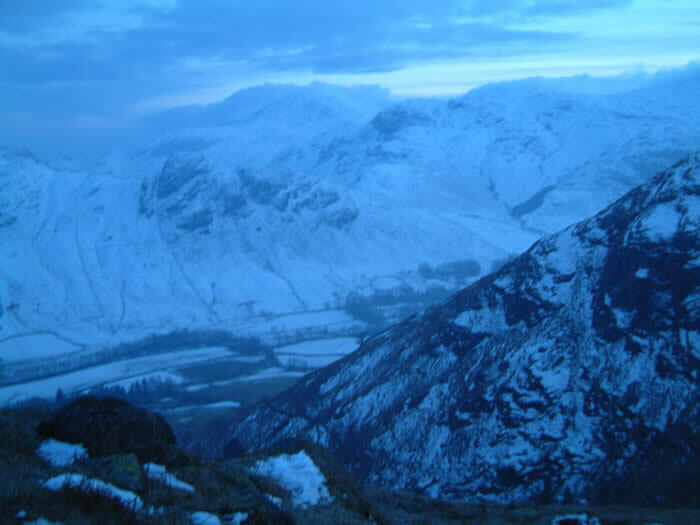 They were located just as darkness fell in the upper regions of Rest Gill and helped down from the fell. 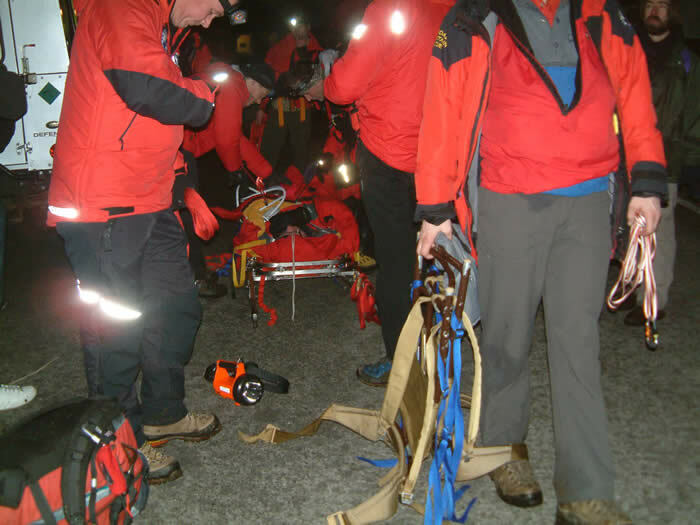 A male sustained a suspected (and very painful) hamstring injury after slipping on ice. 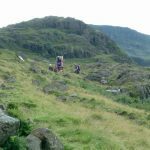 We were called to assist the Langdale & Ambleside Team in stretchering him down from the east side of Stickle Tarn to the valley floor. He was then transported to hospital. 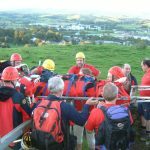 The Team’s Leader Group were paged by the police following a report of a flare being seen in the area of Boundary Bank near Kendal. Enquiries were made but this was a one-off sighting and there were no other reports. It was agreed with the police that no further action would be taken unless there were further reports and/or information. 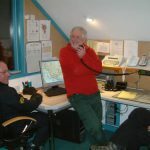 The rest of the Team was not paged. 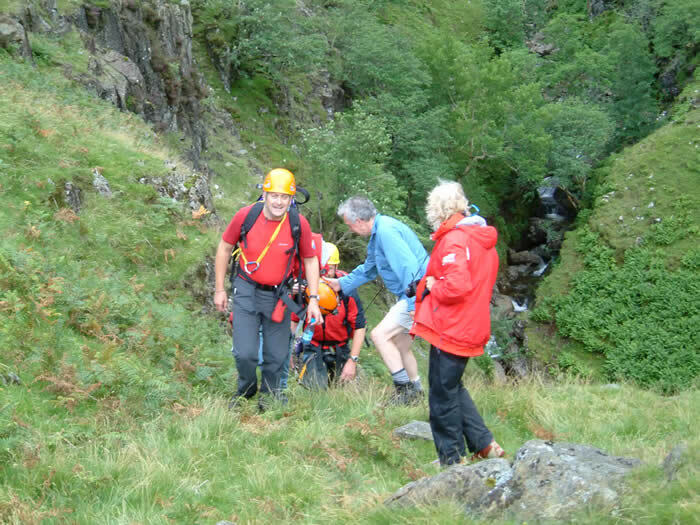 The Team was called to assist a 62 year old female who had fallen on the main path down from Gummers How. 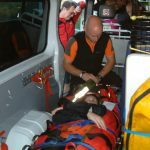 She was found to have a lower leg injury so the team administered pain relief, splinted her leg and stretchered her down to a waiting Ambulance for onward transport to hospital. 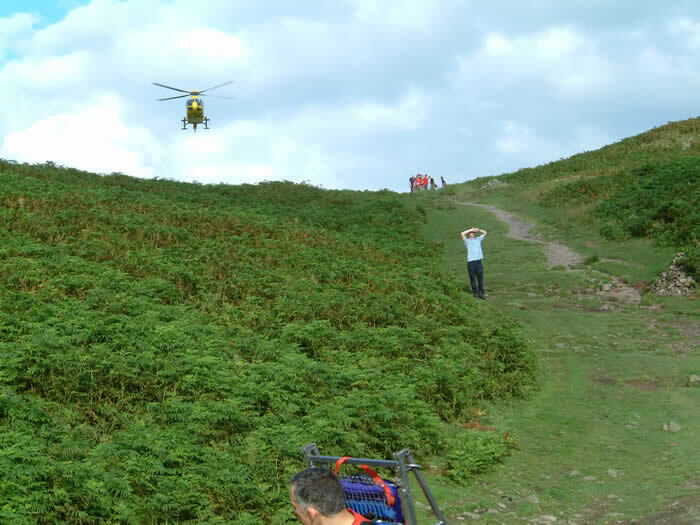 The Team was paged by the police following reports of a male around 50 years old appearing dizzy and confused on Hampsfell near Grange-over-Sands. 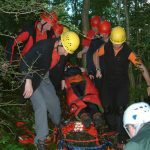 The team found the casualty unable to make his own way down so he was stretchered to one of our Land Rovers and taken down to a waiting ambulance. 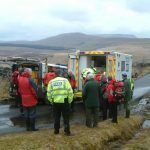 The Team was asked to assist the Kirkby Stephen team by relieving other teams in a search for two missing persons to the north of the A66. 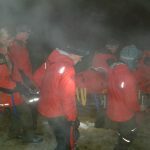 We were asked to assemble at out base at 04.00hrs on Saturday 27 March. 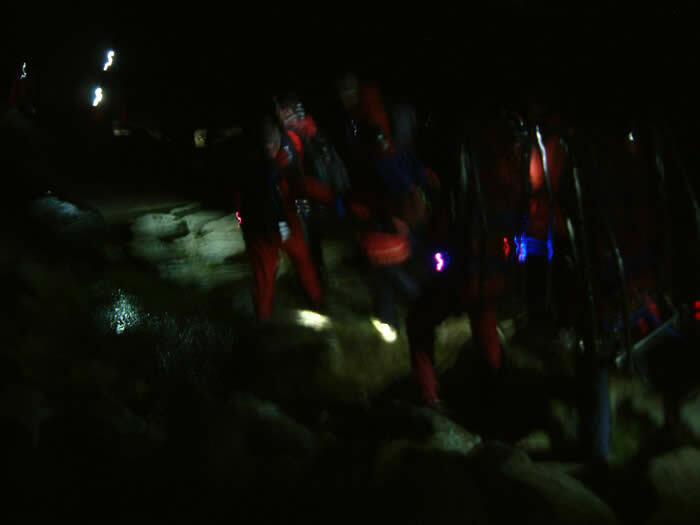 Fortunately, the missing persons were found and we were stood down at 22.55hrs. 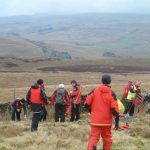 We were called to assist other teams in a search for a 68 year old man who had been missing all night on the moors above Garsdale. 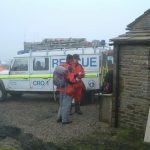 He was found at about 11.30 hrs on Garsdale Common by search dog Misty (handler Des – SARDA and Teesdale & Weardale Team). He was wet, exhausted and very cold but otherwise in good spirits. 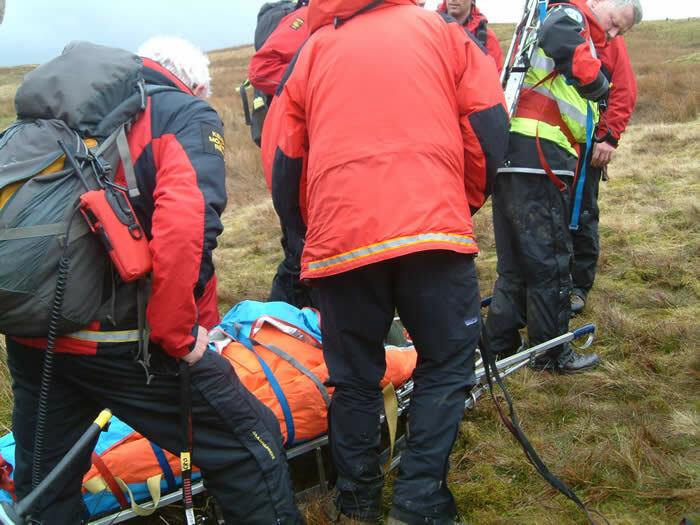 We were searching nearby so we assisted in carrying him down to the road where we transferred him to an ambulance for onward transport to hospital in Lancaster. 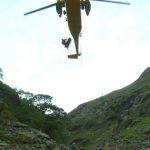 The Langdale & Ambleside Team were called to assist a male with a dislocated knee at the top of Rossett Gill, Great Langdale. 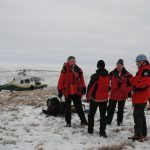 As there was some doubt about the availability of an air ambulance and there was a high probability of a long steep carry-off, we were asked if we could provide a vehicle full of team members to help. 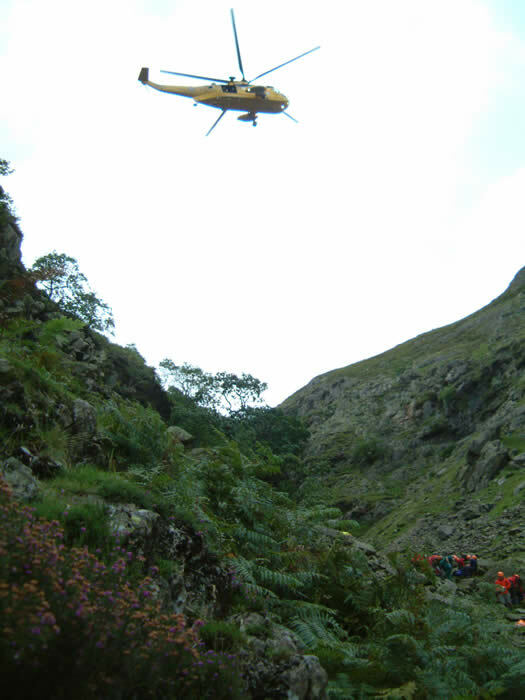 We sent one of our Land Rovers and five personnel to the bottom of the Rossett Gill path but we were stood down when an air ambulance did arrive and the casualty was flown to hospital. 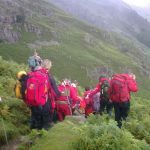 The Team was asked to attend Gummers How to assist a 58 year old male from Middlesborough who had been reported as “fallen, unknown injuries”. 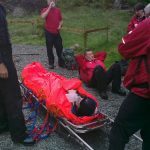 We met the casualty walking down the main path with an ambulance crew. He had apparently tripped and sustained lacerations to his head. He was transported on to hospital in the ambulance. 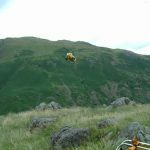 We were asked to assist the North West Ambulance Service with a casualty who had fallen from a mountain bike at Fell Foot Brow. As the Team was assembling, we were told that an ambulance crew was with the casualty and we were stood down. 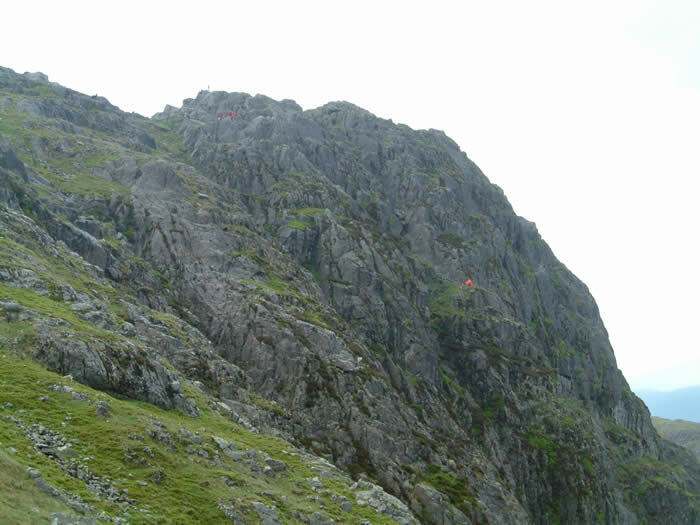 A group of four men were climbing Jack’s Rake on Pavey Ark (Great Langdale). 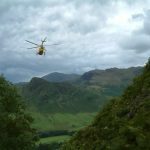 One of them fell, sustaining a very painful dislocated shoulder and we were requested to assist the Langdale & Ambleside Team. 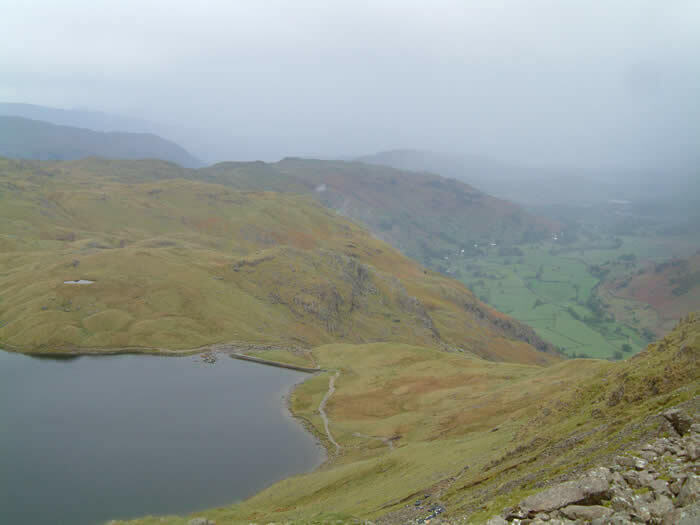 On the way up we enjoyed a good sample of late May Lake District weather – sun, hail and torrential rain. 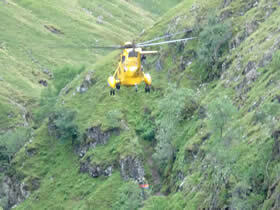 A Sea King helicopter was requested at an early stage and we were please to hear that there was one in the area. Unfortunately, it developed a fault and another Sea King was tasked from RAF Valley with a 50 minute fly time. Again unfortunately, this aircraft was diverted to deal with incidents in the Buttermere and Keswick areas. 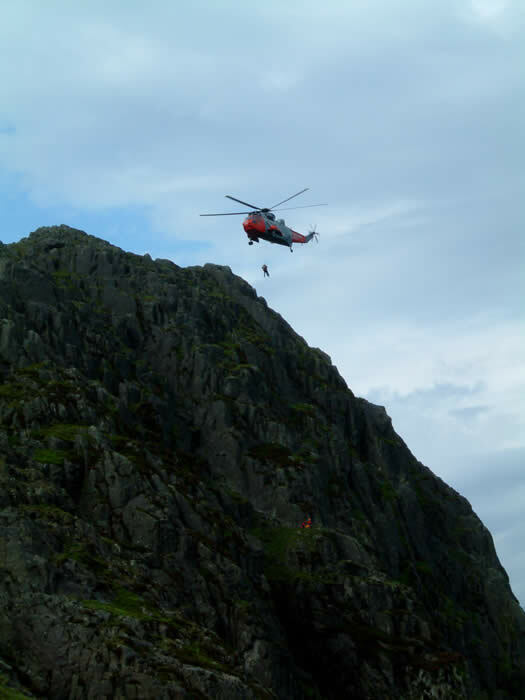 The teams were contemplating hauling the casualty up to the top of Jack’s Rake and undertaking a very long and difficult carry-off by stretcher but fortunately the Sea King eventually arrived, winching the casualty up and taking him to hospital. 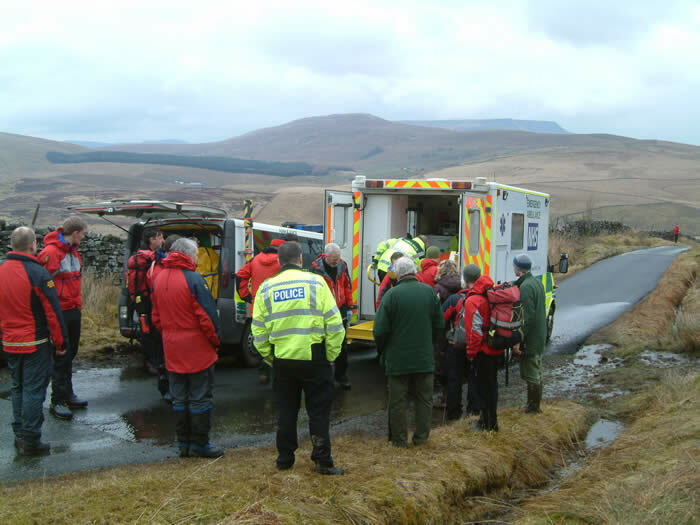 We were called, along with other teams from the north west of England and southern Scotland, to assist the police in the aftermath of the tragic shootings in West Cumbria. We were tasked to search roadside verges and adjacent land in the area. Team Supporters were marshalling on the Kentmere Trail Race, with a Team vehicle in attendance (primarily for publicity purposes). 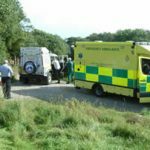 The vehicle and driver (a Casualty Carer) were called upon to assist in a number of medical emergencies at the event during the afternoon including fall injuries, painful joints and exhaustion. 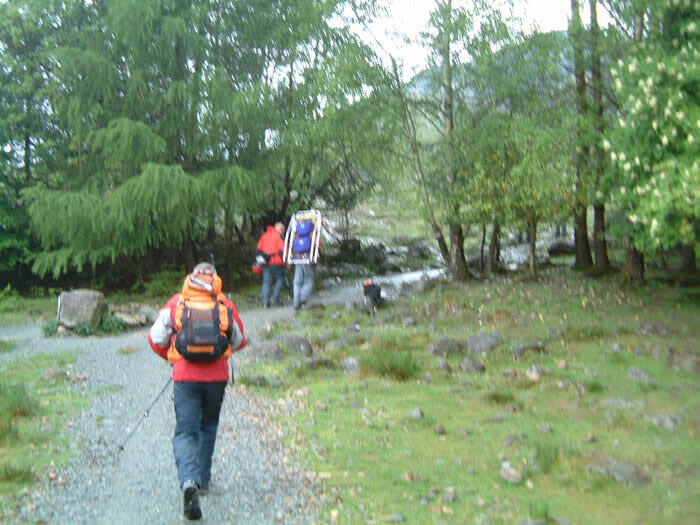 The Team’s Leader Group was paged by the police regarding a missing person. 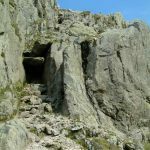 Enquiries established that the incident was to the east of Dent in the area covered by the Cave Rescue Organisation. 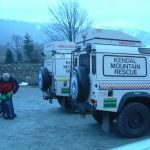 The call was passed to them with the offer of help from the Kendal Team if required. 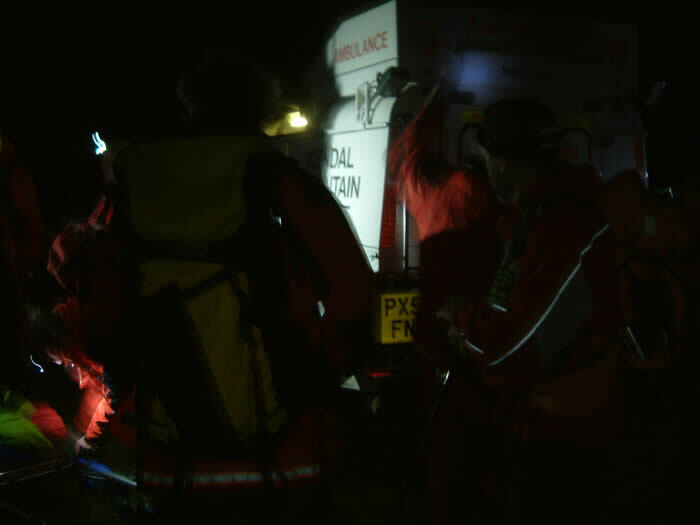 We were requested to give assistance at 17.20 hrs and, sadly, a man’s body was found by one of the search dogs shortly after the Team arrived. 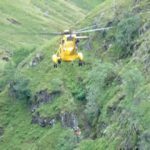 We were called to search for an elderly lady who was missing from her home in Ings. She was considered to be vulnerable. 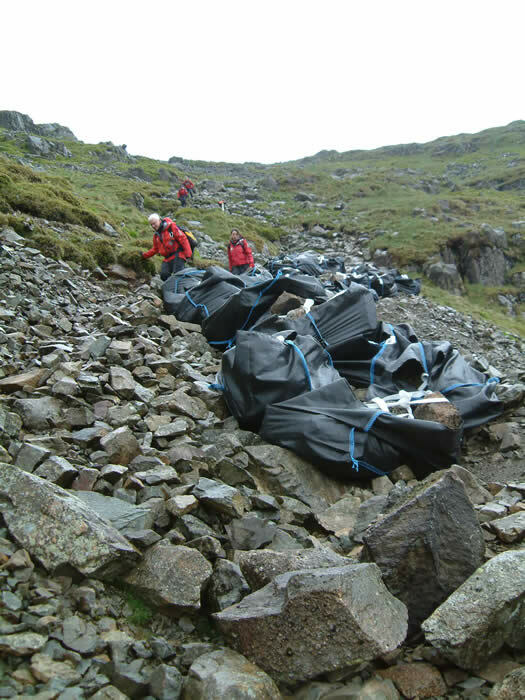 The Langdale & Ambleside and Duddon & Furness teams and SARDA (search dogs) were also involved in the search. 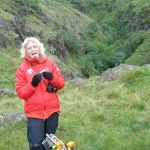 She was found by a member of the Duddon & Furness team in bushes at the side of the Staveley Bypass shortly before 18.30 hrs. 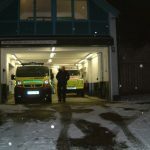 The lady seemed to be reasonably well, if a little cold, and was taken to hospital in a County Ambulance for a check up. 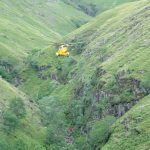 The Team was paged by the police and asked to attend a male who was reported to have fallen near Cautley Spout and sustained a possible fractured arm. 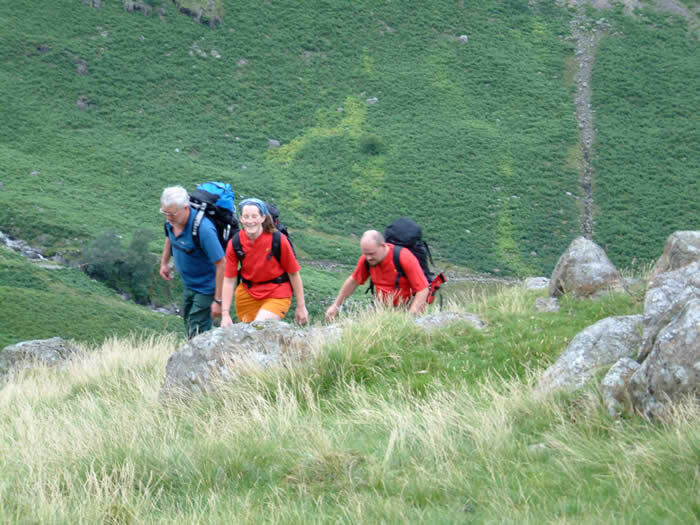 The man was assisted on the hill by several walkers and felt able to start making his own way down with them. 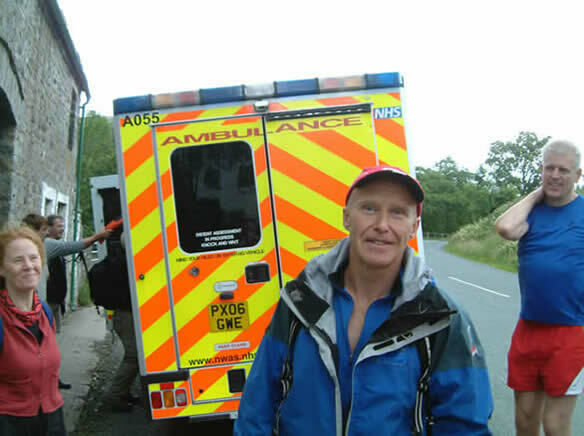 He arrived at a waiting ambulance at the Cross Keys shortly after our first vehicle reached that location. 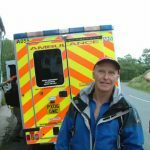 One of his rescuers turned out to be the famous mountaineer Alan Hinkes (see photograph). 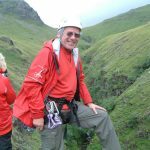 Alan remains the only Briton to have climbed all 14 of the Himalayan peaks over 8,000 metres (including Everest and K2). 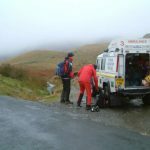 On a very wet evening, we were called to assist the Langdale & Ambleside Team with a male who had injured his ankle near Angle Tarn. 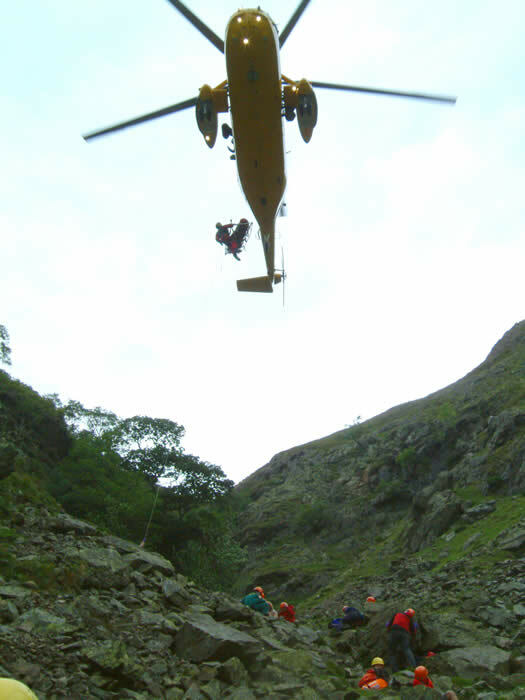 We helped to carry him down Rossett Gill and an L&A vehicle then took him to their base in Ambleside where he was transferred to a County Ambulance. Team members were all home by midnight. 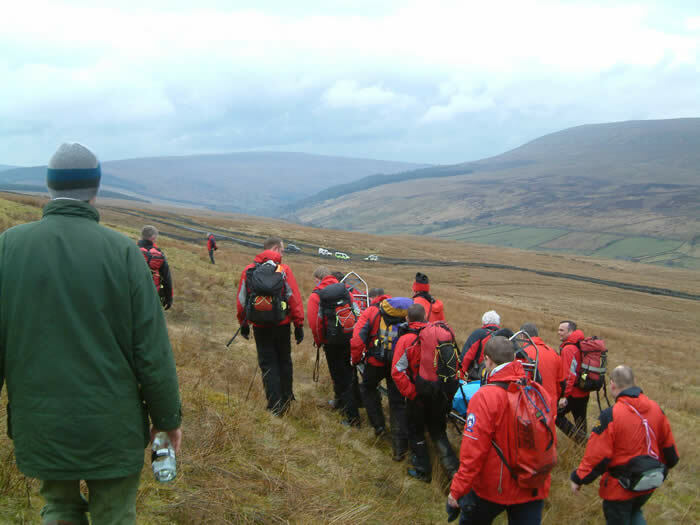 Our Leader Group was paged by the police in relation to a 31 year old man who had reported himself lost in the Baugh Fell area to the north of Garsdale in deteriorating weather conditions. 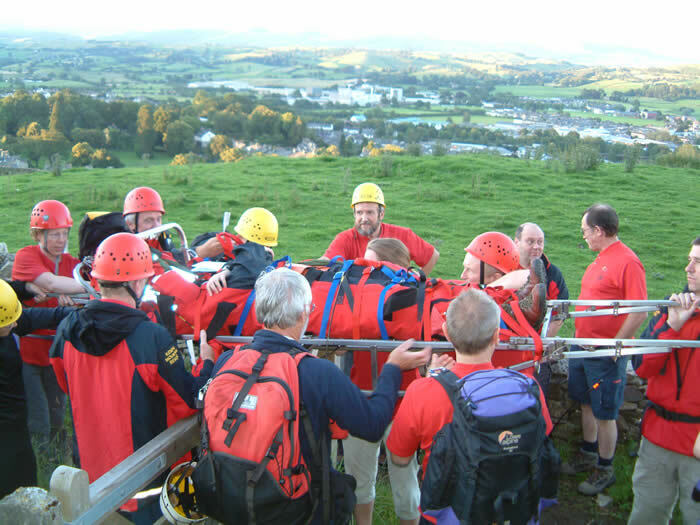 This area forms the boundaries to 4 team areas (Kendal, CRO, Kirkby Stephen and Swaledale). 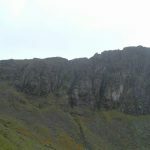 Our Team Leader spoke to the lost man several times on his mobile phone in an attempt to establish roughly where he was. 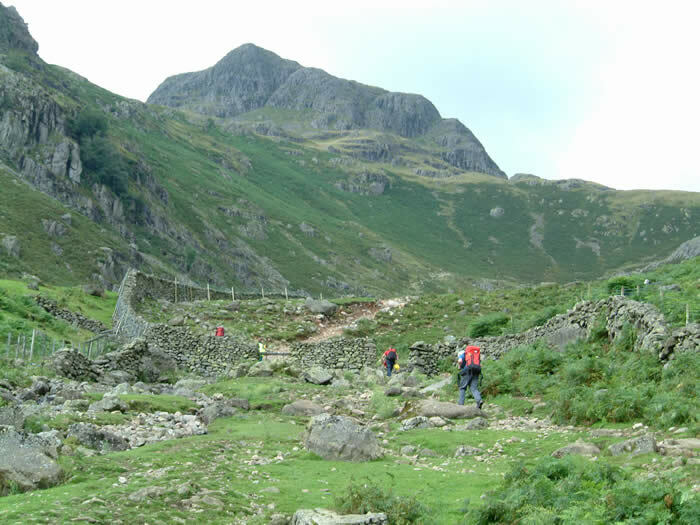 This resulted in only a vague idea and it was established that he had no map (he said it had been blown away), no compass, no waterproofs and no rucksack. 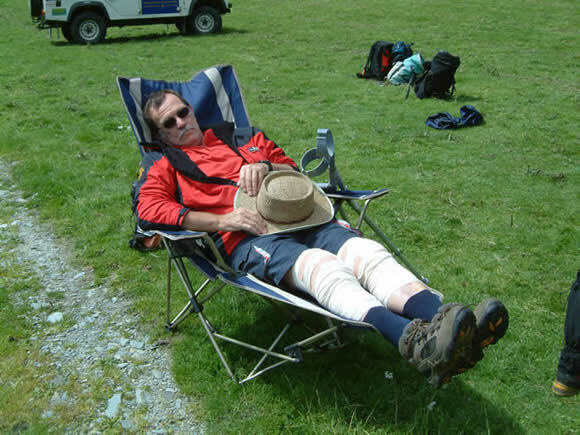 Following liaison with the other teams it was agreed that Kirkby Stephen would deal with this incident. 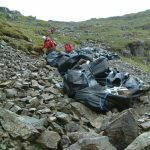 Just as this had been sorted out we were on another callout – see below. 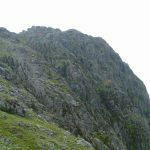 The Langdale & Ambleside team were already involved with a search for two missing persons on Crinkle Crags when they were called to another incident. 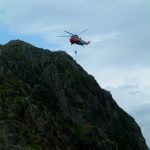 This involved a male with a knee injury on the Mark Gate path above Raven Crag in Great Langdale and we were called to assist. 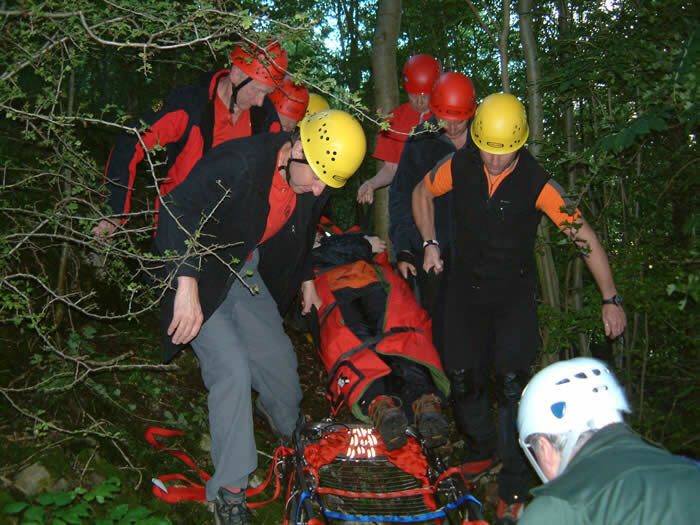 The steep and very slippery path made for a difficult stretcher carry but the casualty was taken down to the car park at the New Dungeon Ghyll from where we transported him to hospital in Kendal. 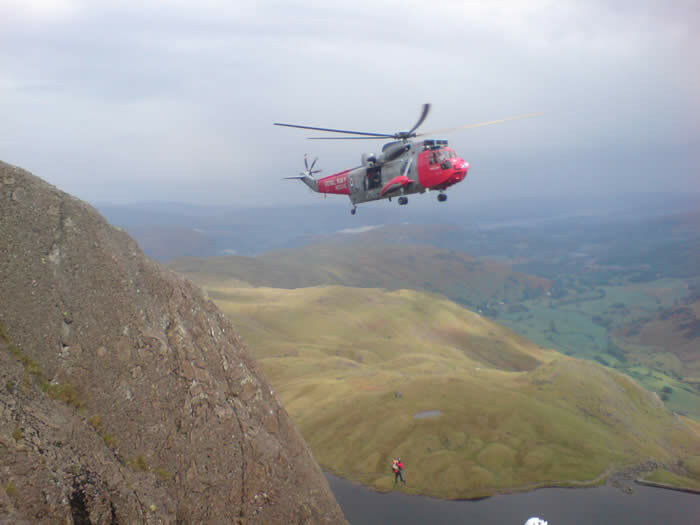 During our journey back to Kendal, we were put on standby at 20.35hrs to join the search for our friend on Baugh Fell – see above. 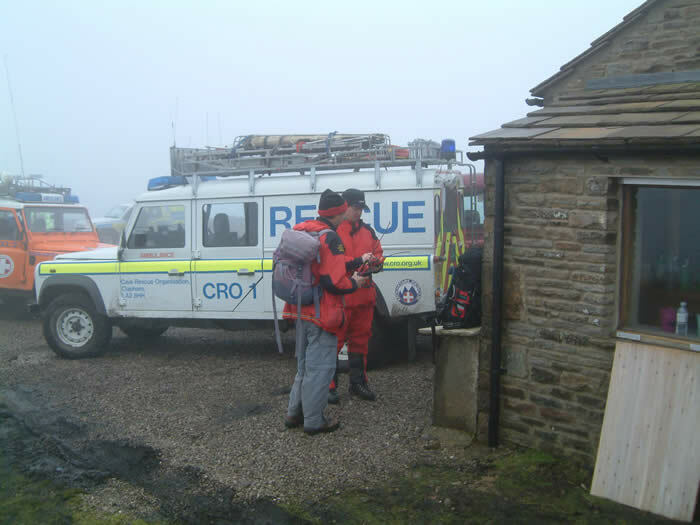 Fortunately (as the weather was continuing to worsen), he was located in the vicinity of Hebblethwaite Hall shortly after and we were stood down at about 21.10hrs. 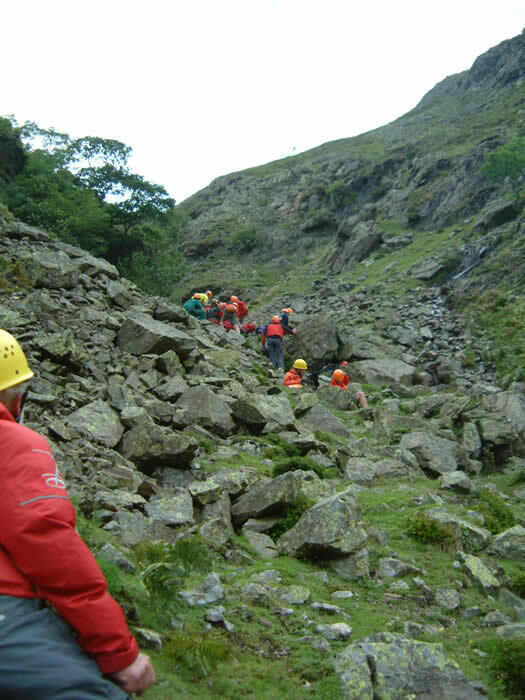 We were asked to assist the Langdale & Ambleside team with the evacuation of a young boy who had sustained a knee injury in Browney Gill (Great Langdale). 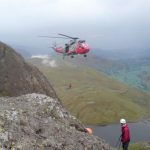 Even though an RAF rescue helicopter had been requested we took crag equipment and a stretcher up to a point overlooking the cas site (you can never be sure of a helicopter evacuation until the aircraft has arrived and picked up your casualty). 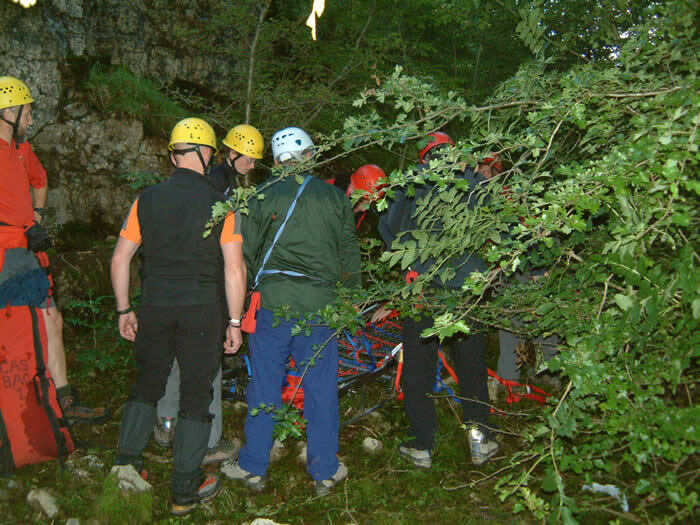 L&A team members were already with the casualty. 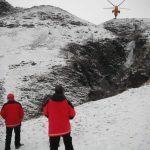 The helicopter did arrive and we again witnessed some excellent flying when the pilot hovered in the gill while winching the injured boy on board. 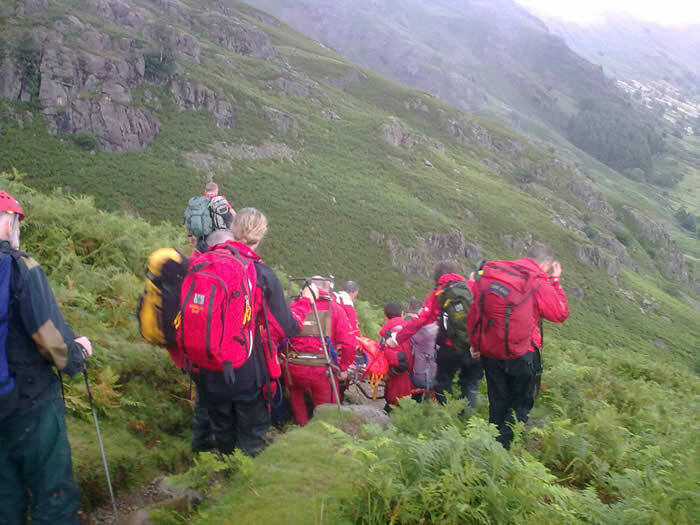 The Team’s Leader Group was paged by the police in connection with a report of a fallen male who had a possible dislocated shoulder. 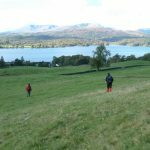 Further enquires established that the location was on Keswick Team’s patch and so the job was passed to them. 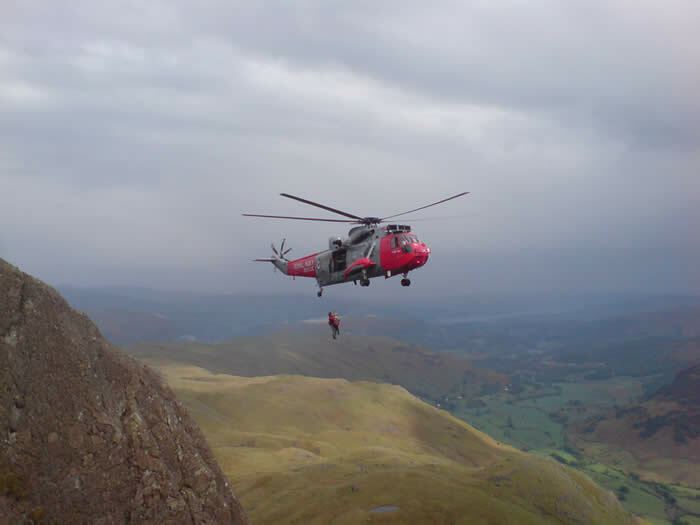 Another Langdale & Ambleside assist. 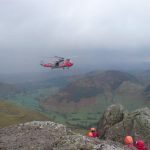 The L&A Team were just finishing a job at Far Easedale when they were alerted to an incident on Helm Crag where a male had a lower leg injury. We joined with a few L&A team members to deal with this one. 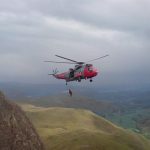 The casualty was carried further up the fell by stretcher to a flat area where he could be transferred to the Air Ambulance. 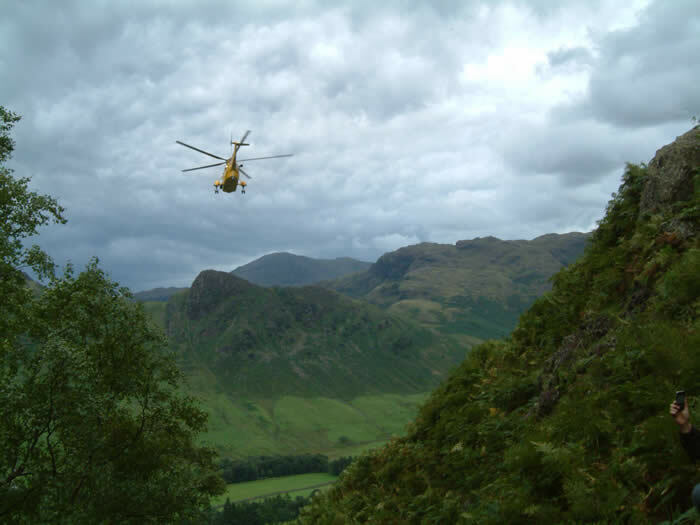 The Langdale & Ambleside team requested our assistance with a male who had fallen about 50 feet down a very steep rocky slope in a small gill just to the west of Swine Knott in Great Langdale. 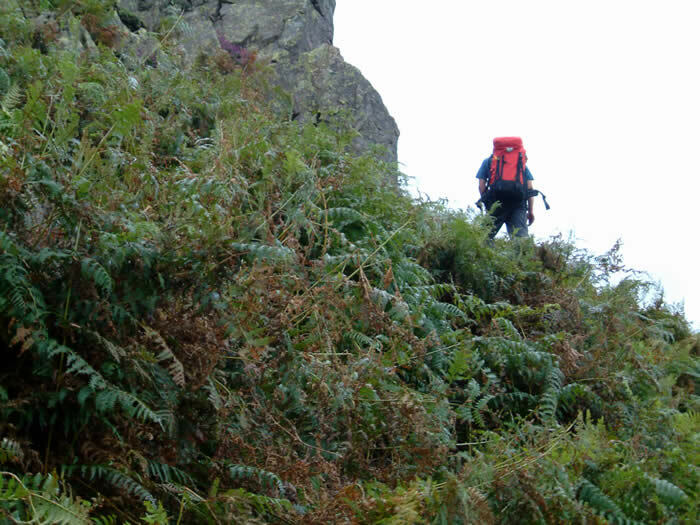 We carried heavy kit up steep and bracken covered ground. 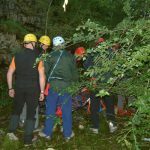 The casualty had a shoulder injury and lacerations to his face. 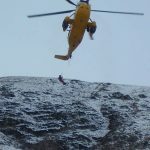 He was treated by a paramedic from the NW Ambulance Service and L&A team members, secured to a stretcher and winched up into a Sea King helicopter from RAF Boulmer for onward transport to hospital. 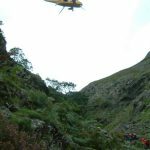 We were called to assist the Langdale & Ambleside team with a casualty on The Band (Great Langdale) as they were a little short on numbers. 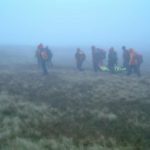 We were stood down as team members were assembling, however, when L&A established that the casualty was not very far up the hill and was hobbling down. The police paged the Team and asked us to assist a female who had fainted while walking above Eggerslack Wood on Hampsfell. 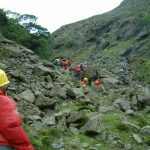 The casualty had regained consciousness and she was assessed by a paramedic from the North West Ambulance Service. 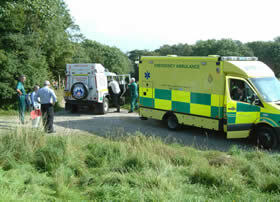 She was then taken down the track in one of our Land Rovers to an ambulance for onward transport to hospital. 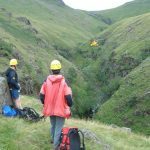 The Penrith team asked us to go on standby as they were searching for a male mountain biker who had become benighted in the Mosedale Cottage area. He was apparently only wearing his cycling kit and he walked up a hill to get a signal on his mobile phone. 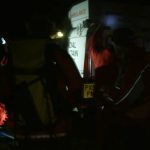 The Penrith team located him (cold and wet) at about 01.30 hrs and we were stood down at 01.40 hrs. 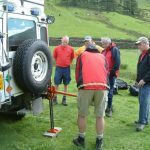 However, we continued to monitor progress for a short while and offered to send one of our Land Rovers up Longsleddale to Brownhowe Bottom to transport the casualty and two Penrith team members down. This offer was accepted and a Penrith vehicle met up with them on the A6 at Garnet Bridge. Headed off home to bed at about 03.00 hrs. 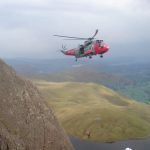 The Langdale & Ambleside team were engaged in a search on Crinkle Crags when they were called again in connection with two missing persons who were last seen in the Angle Tarn area. 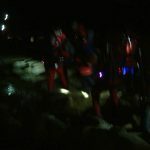 They dispatched a small group towards the Tarn and called us for assistance. 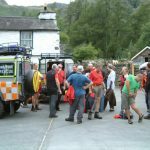 Just as our first vehicle was leaving base we were stood down when a report came in that the missing persons had turned up in Borrowdale. 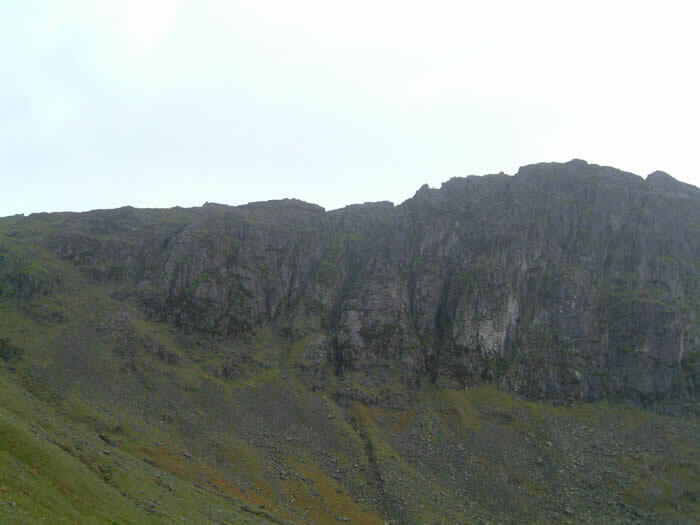 L&A made a find on Crinkle Crags a short time later. We pleased to avoid a wet night on the hill. 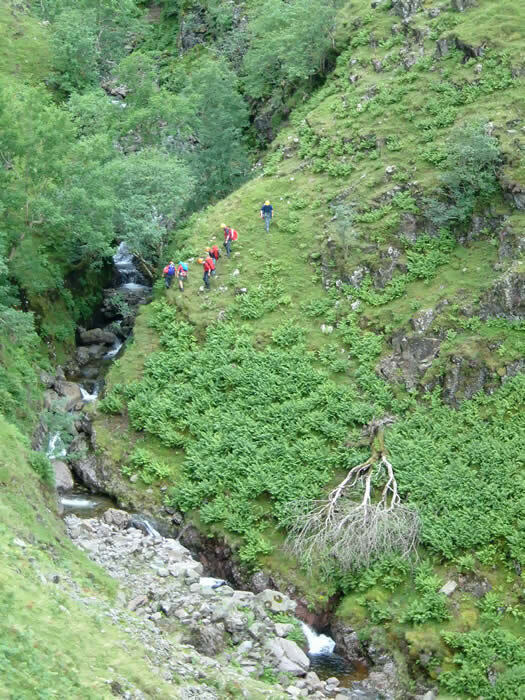 The police requested our assistance with an incident in Longsleddale. 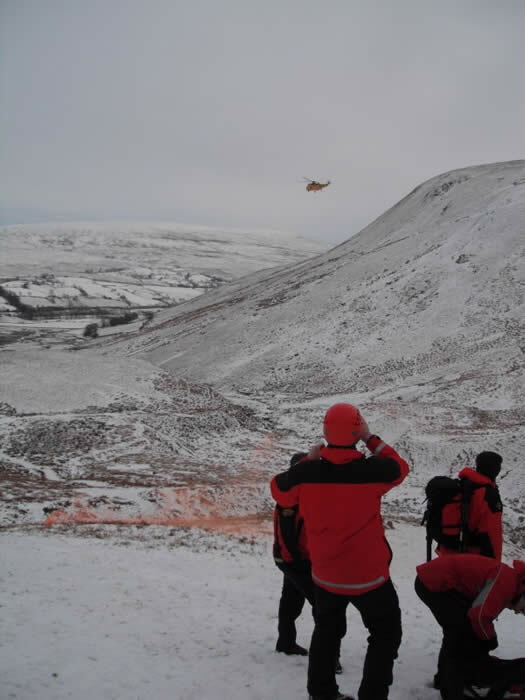 The Team was already on an East Cumbria Search Panel training exercise in the Howgills but one of our Land Rovers and four team members attended. 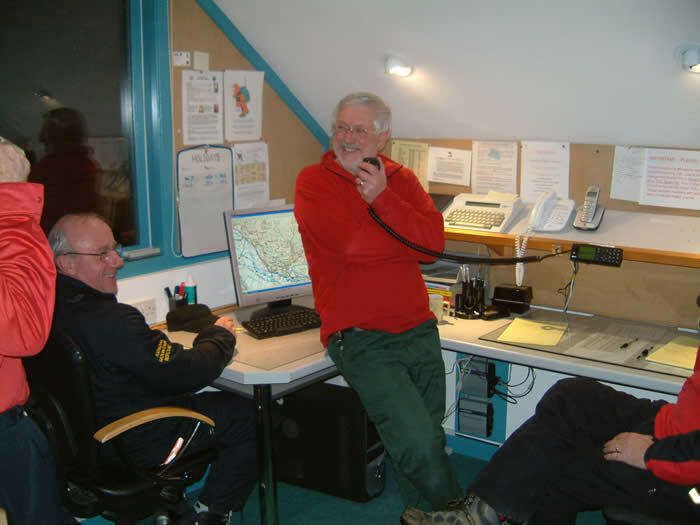 The police paged the Team and asked us to attend a 73 year old male who had fallen on the top of Arnside Knott. He was found to have a nasty gash on his head and he was transported to the Royal Lancaster Infirmary in one of our Land Rovers. 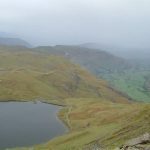 The police were alerted by a member of a YMCA group staying at Reservoir Cottage (near the Kentmere Reservoir) after hearing what was thought to be shouts for help in the hills behind the cottage. There was no reply when our Team Leader tried contacting the informant so no further information could be gained. 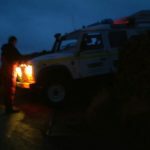 After several telephone calls to various local residents in the area, a team Land Rover with 2 personnel on board was despatched to have a look round and make enquiries. It seemed that there had been a lot of farmers rounding up sheep and it was decided that it may have been them calling their dogs. 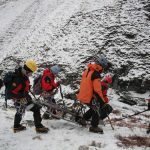 After several discussions, and with agreement with the police, the Team Leader decided that nothing further could be done. Later on the informant contacted the Team Leader as the group were on their way home to Blackburn. 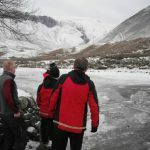 It was interesting the group had a satellite phone but could get no signal in the Valley!!! A call out with good intent, but it is worth mentioning that this incident highlights the advice to stay put by the phone once the police have been informed and wait for the MRT to contact you. 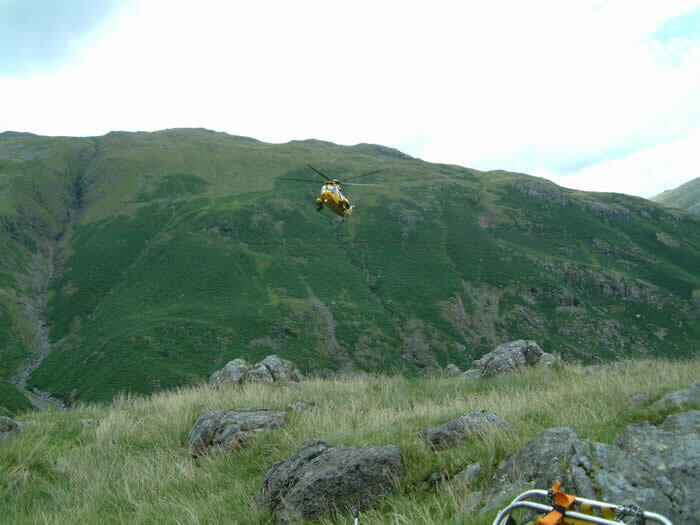 We were requested to assist the Langdale & Ambleside team with a male who was reported to have collapsed on Great Knott. We were stood down en-route when the casualty was reached by the Air Ambulance and air lifted to hospital. 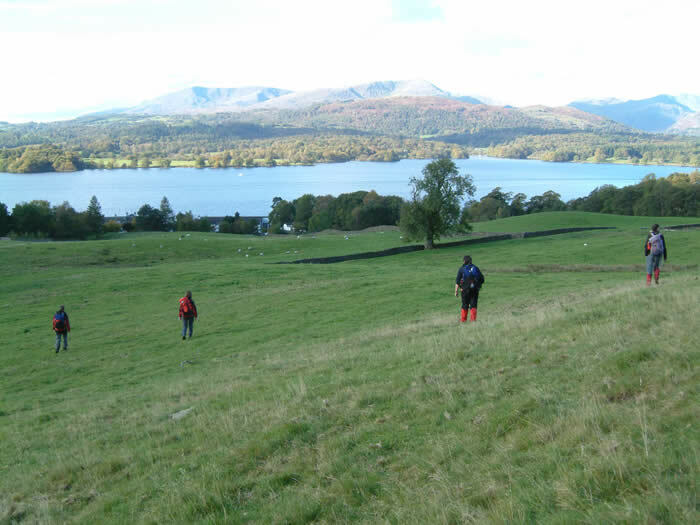 The Team was asked to assist the Langdale & Ambleside team in a search in the Lowwood area for a male who had been missing for a significant period of time. This request followed further information being obtained by the police. Unfortunately, nothing was found to shed any further light on this mystery. 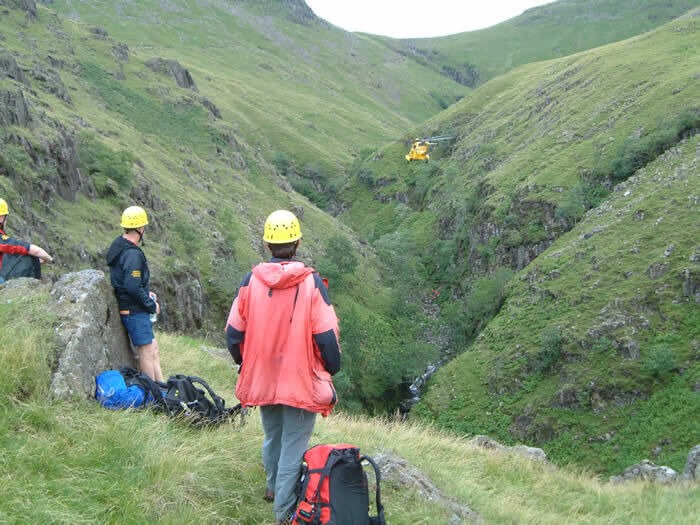 Just as we arrived back at base following the above search, we were asked by the police to assist the North West Ambulance Service with a female who had fallen while climbing on the crags on Hutton Roof. 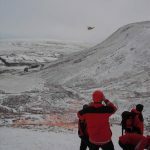 The casualty was taken off by the air ambulance shortly after team members arrived at the village. 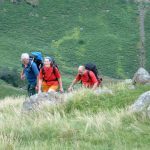 The police paged the Team’s Leader Group regarding a male who was walking in the Kentmere area and had been reported as significantly overdue. 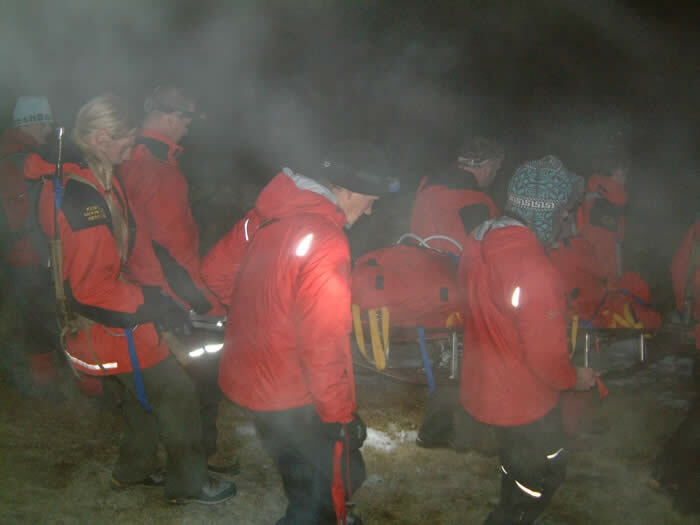 There was particular concern due to a known medical condition and approaching darkness. While further enquiries were being made the whole Team was put on standby for a search. Fortunately, the missing person turned up fit and well before anyone missed their dinner. 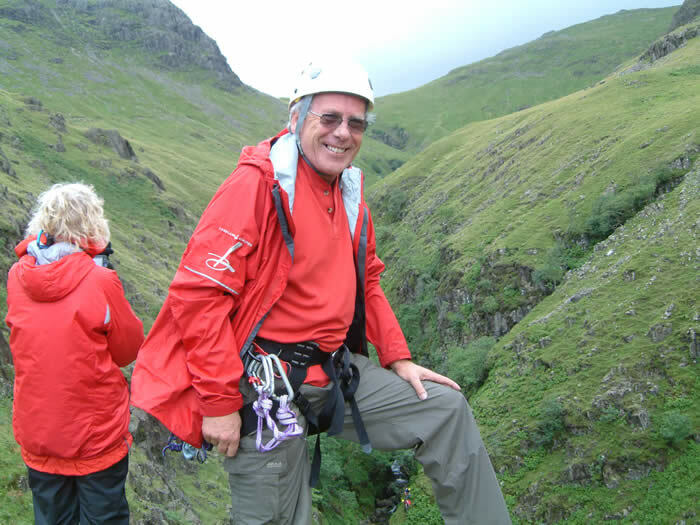 The Langdale & Ambleside team requested our assistance when they got a second job. 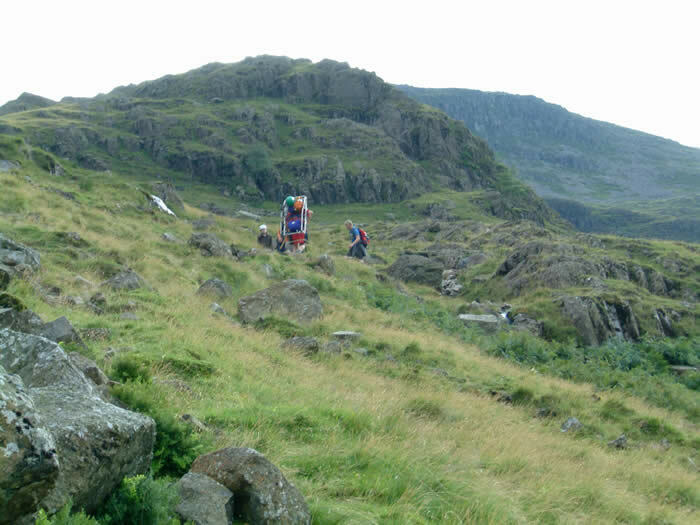 We were asked to attend a casualty with a lower leg injury on Harrison Stickle. An air ambulance was also requested. 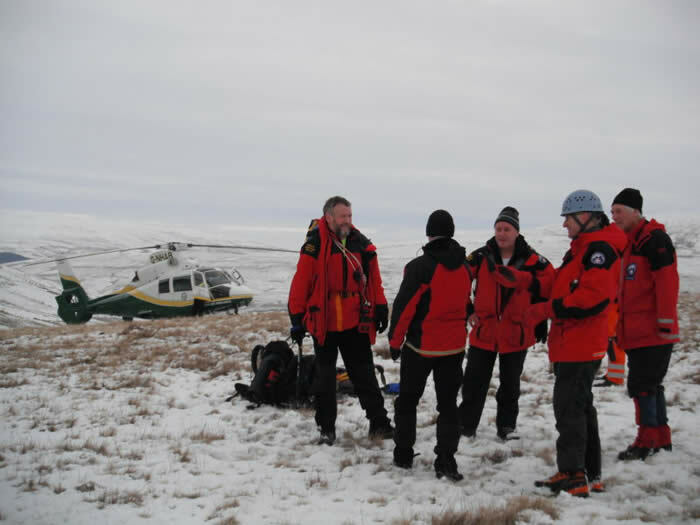 The Great North Air Ambulance reached the casualty while we were on route and we were stood down. 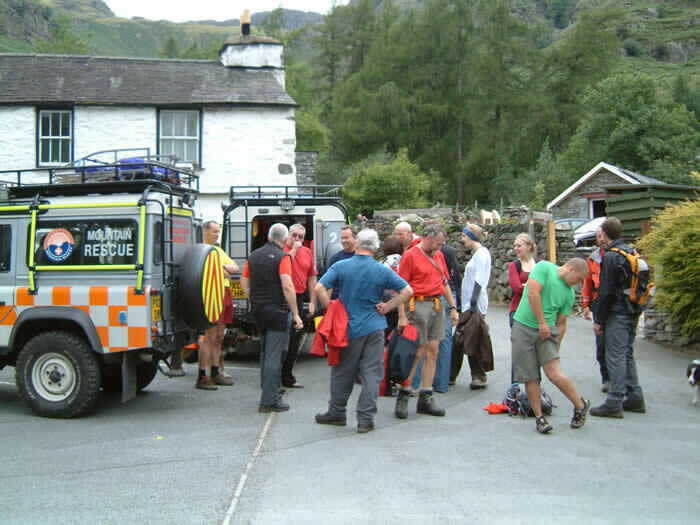 We were again called to assist the Langdale & Ambleside team (must be Half Term!). 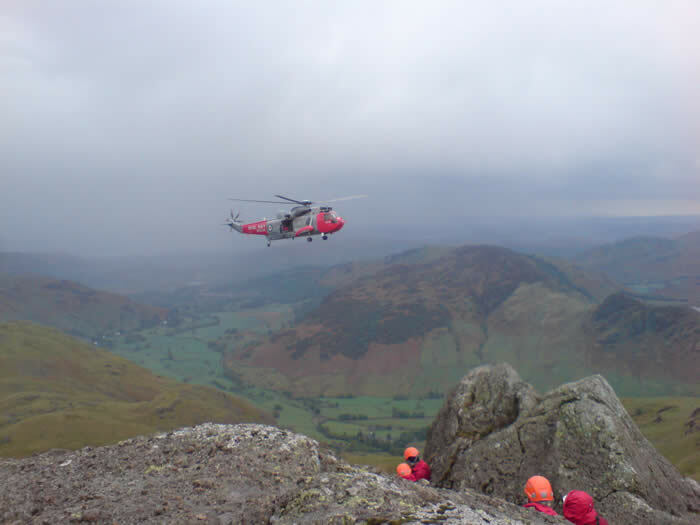 This time it was a male with a lower leg injury at the bottom of the “Bad Step” on Crinkle Crags. L&A got another job while we were on our way up so we ended up pretty short-handed with lots of heavy kit. It got wetter and wetter, visibility was very poor then it went dark. Oh the joys of MR! Carry-offs don’t get much longer than this. Anyway, job done and home by 9.30pm. 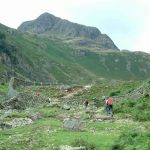 Two female walkers had reported themselves lost and benighted in the Langdale Pikes. 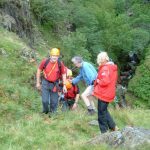 They had thought that they were descending Stickle Ghyll but Langdale & Ambleside team members went up that way and failed to locate them so a search was on. 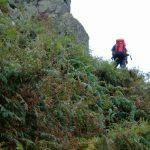 We were asked to assist by going up from the Grasmere side via Easedale Tarn but shortly after we set off up the hill they were located on steep and difficult ground around Mart Crag above Mickleden. 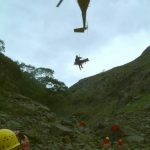 We returned to our vehicles, drove round to Mickleden, ascended the Stake Pass and assisted with the evacuation. 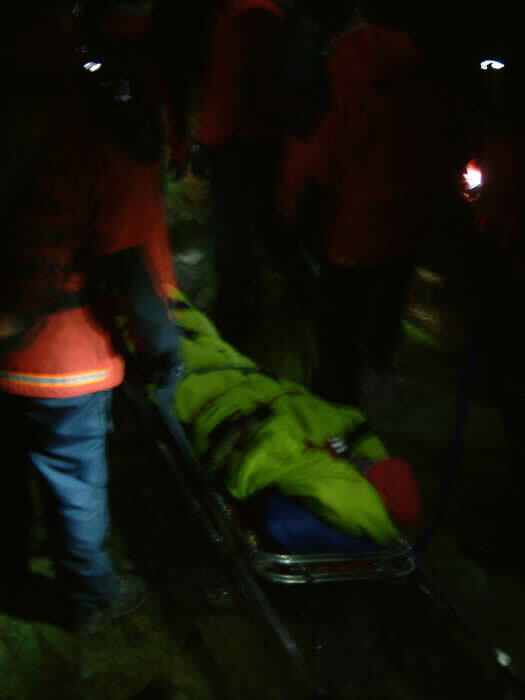 One of the women was able to walk off but the other was cold and exhausted so she had to be stretchered off. 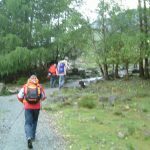 The rain stopped for the carry-off but there was a lot of water coming off the hill – wet feet all round. Home for dinner at about 1am! 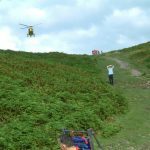 NorthWest Ambulance requested our assistance via the Police to attend a suspected cardiac arrest on a path about 2 km south of Kentmere Hall. 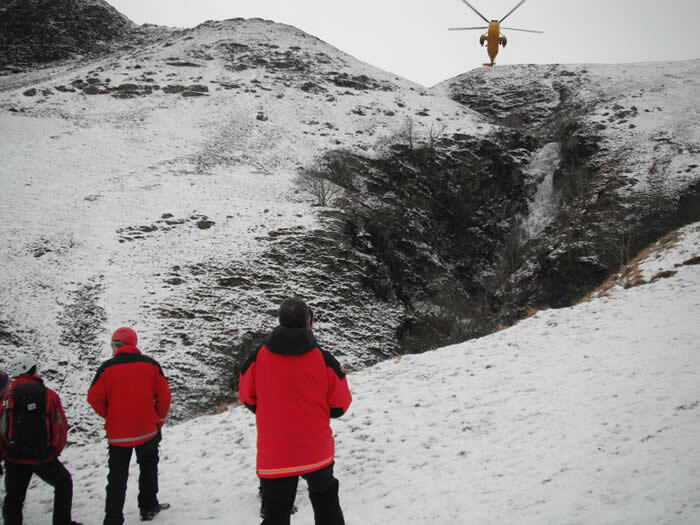 A passer by performed CPR on the casualty until the Air Ambulance and paramedics arrived. Sadly, the 66 year old male died at the scene. 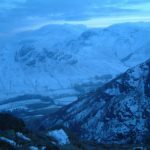 We recovered his body to the Westmorland General Hospital. We were paged by the Police and asked to assist a 70 year old male with a known heart condition who was experiencing chest pains. 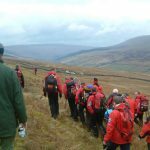 He was walking with a group in the Brant Fell area of the Howgills. An air ambulance was requested but unfortunately this had to abort due to bad weather and approaching darkness. We managed to drive one of our Land Rovers high up to Rowantree Grains. 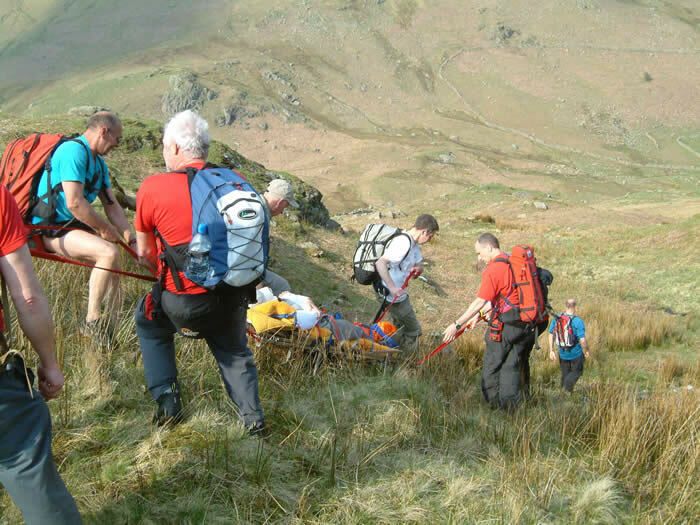 The casualty was treated by team members and transported down from the fell to a waiting Ambulance. 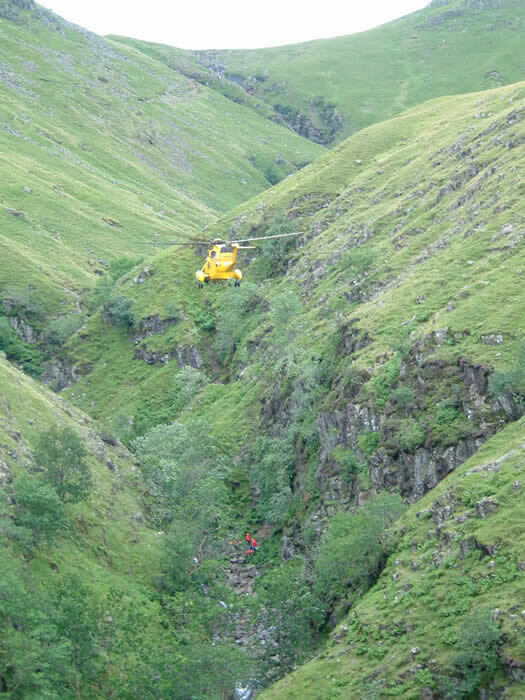 While returning from this incident, one of our vehicles assisted at a road traffic collision to the west of Sedbergh. There were no significant injuries. The Police asked us to assist NorthWest Ambulance with a 75 year old male who was unconscious with a head injury after a fall at his home in Underbarrow. The ambulance was unable to reach the property due to the icy road conditions so we transported the casualty to the ambulance in one of our Land Rovers. 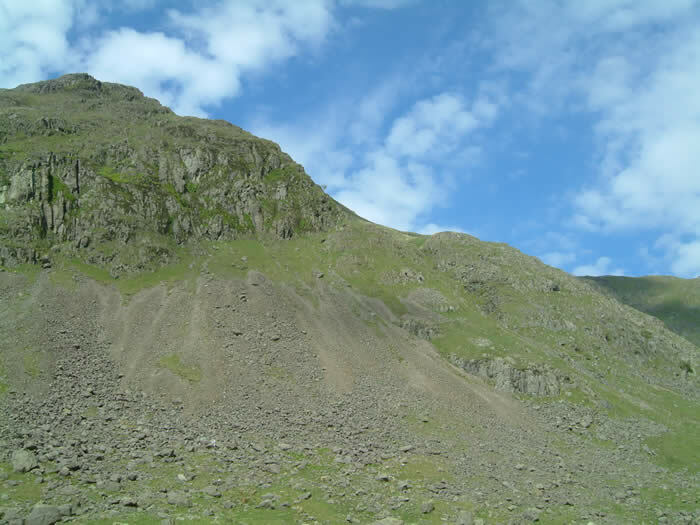 Following a day out training in Kentmere, we were called to assist the Langdale & Ambleside team to recover a female casualty who was found unconscious by a passing walker on the summit of Bow Fell. Helicopters had failed to get through due to the severe weather. 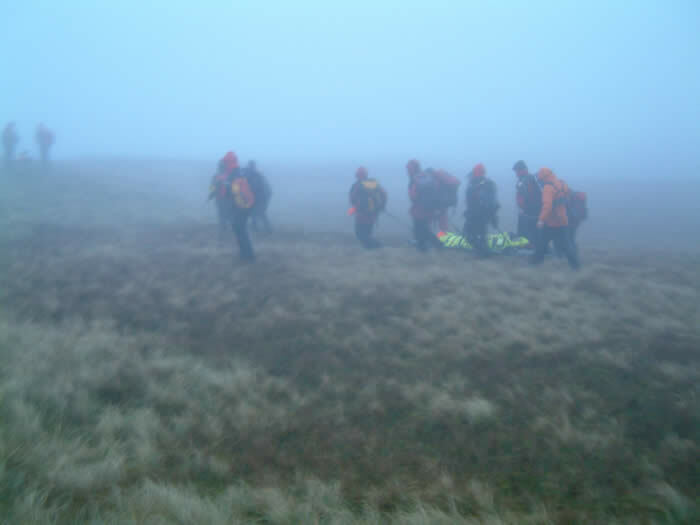 The casualty was located and treated by team members before being carried off the fell in full winter conditions. 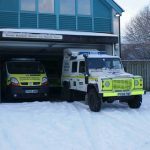 We sent 10 of our team members in two Land Rovers, keeping one Land Rover and some personnel back in anticipation of further incidents developing in the snowstorm that was raging. The Team was quickly put on standby to assist the emergency services. The Police were concerned about the safety of an elderly lady and a child who were trying to get from Kendal to Sedgwick so we gave them a lift. Shortly after, we were back in Sedgwick taking care workers to assist an elderly patient. We were also sent to Bowness to help the Ambulance Service with the evacuation of a female with suspected spinal injuries. We were all tucked up in bed by about 1.30am! 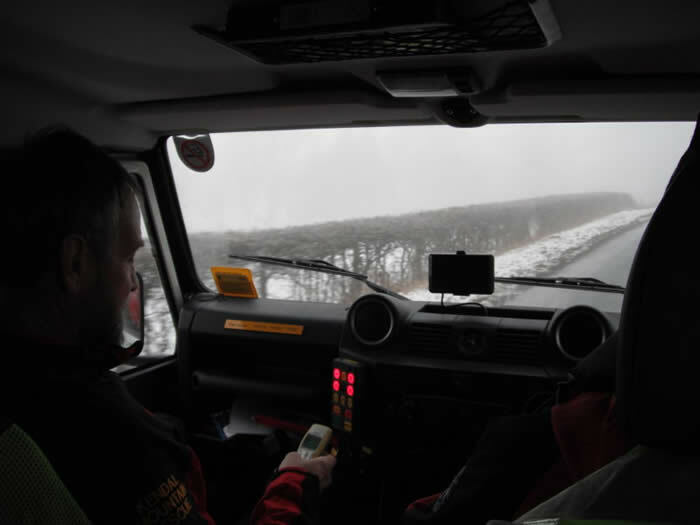 With snowy conditions continuing, we transported a care worker from Kendal to a remote property in Lambrigg and we returned at the end of the day to take her back to Kendal. 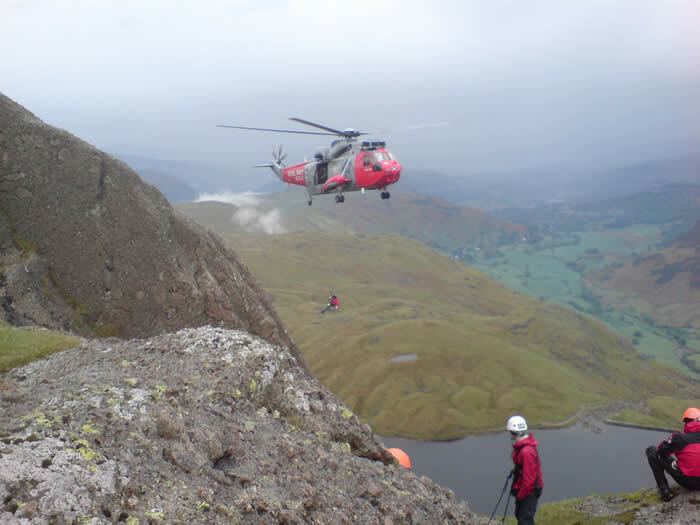 We were asked to assist the Langdale & Ambleside Team with a fallen climber at Tarn Crag (above Easedale Tarn). 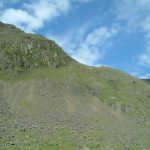 As we were starting up the hill from Brimmer Head Farm, it was established that the location was incorrect and that, in fact, the climber was on the headwall of Helvellyn. 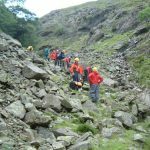 The Patterdale Team were tasked and we were stood down. 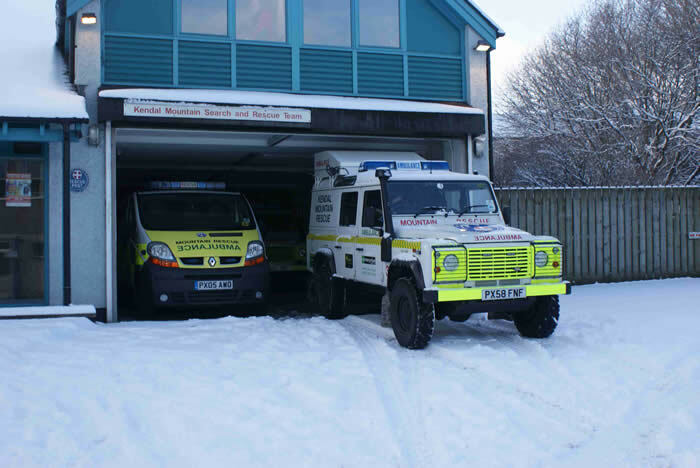 In snowy weather, two team members were asked to take one of our Land Rovers to assist the NW Ambulance Service with a patient in the Singleton Park area, to the east of Kendal. On arrival they found that the ambulance had managed to get to the patient and was just departing for Westmorland General Hospital. 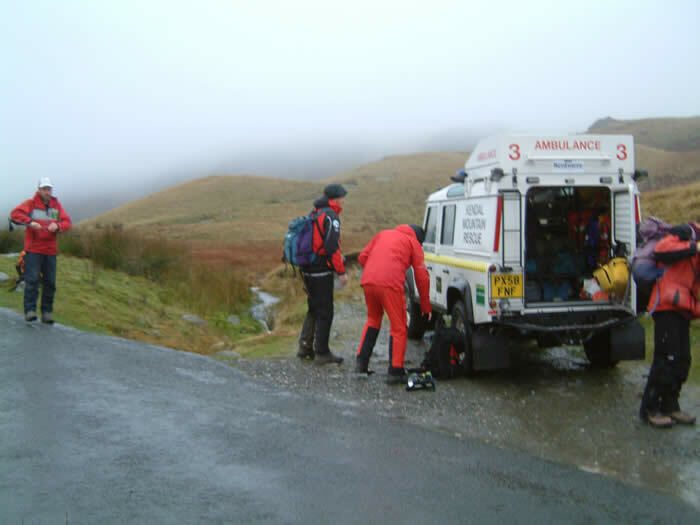 We were asked to assist a couple in Garth Row (to the north east of Kendal) who were having difficulty getting to the Westmorland General Hospital due to steep slippery roads. 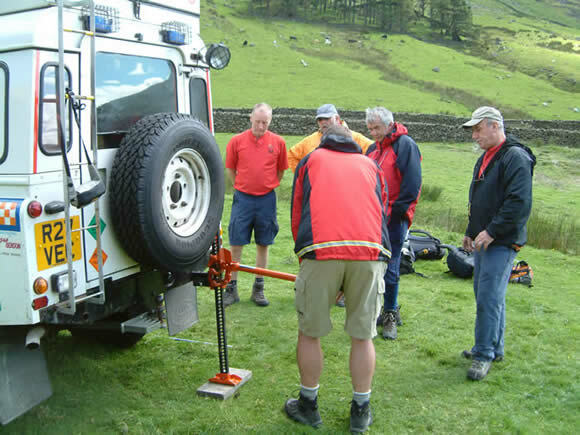 Two team members assisted in one of our Land Rovers. 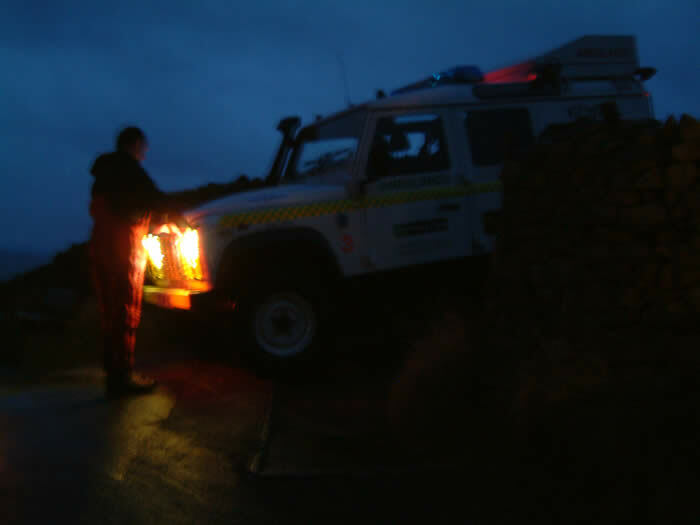 Two of our team members transferred a patient from Crook by Land Rover in slipery conditions. The Police paged our Leader Group following a report of a flare being sighted in the Hutton Roof area. Enquiries were made but no further information could be obtained. It was agreed with the Police that no action would be taken unless more details became available. 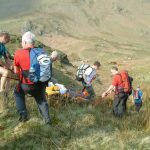 Team members had just set off on a pre-Christmas social walk in the Kentmere valley when we were asked to assist the North West Ambulance Service with a casualty near Grayrigg who was thought to have suffered a stroke. 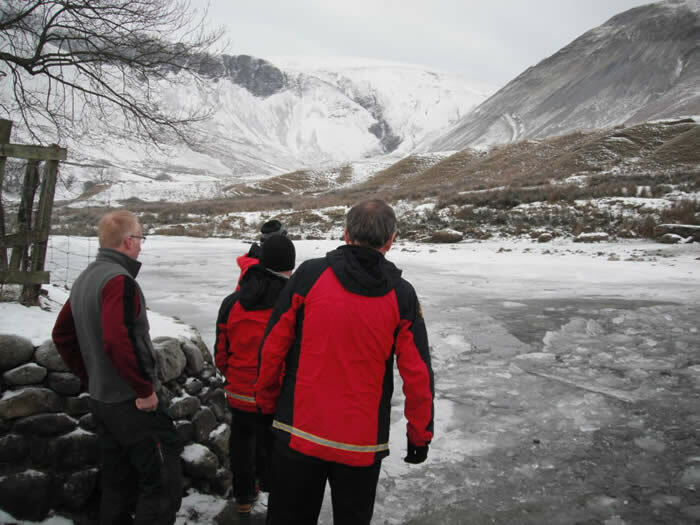 Icy conditions could have prevented the ambulance from gaining access to the remote property so we re-called one of our Land Rovers which went to help. 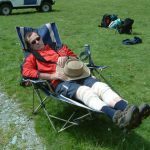 Those team members involved still got back in time for a pint and a sandwich! 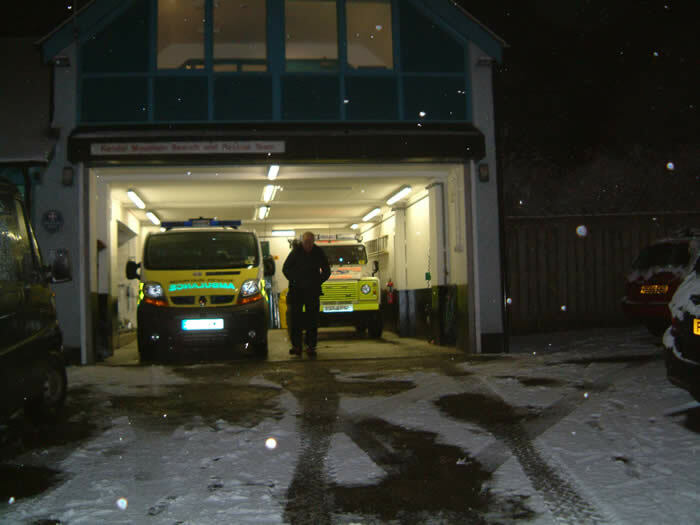 We were asked to assist the North West Ambulance Service at High Borrans. 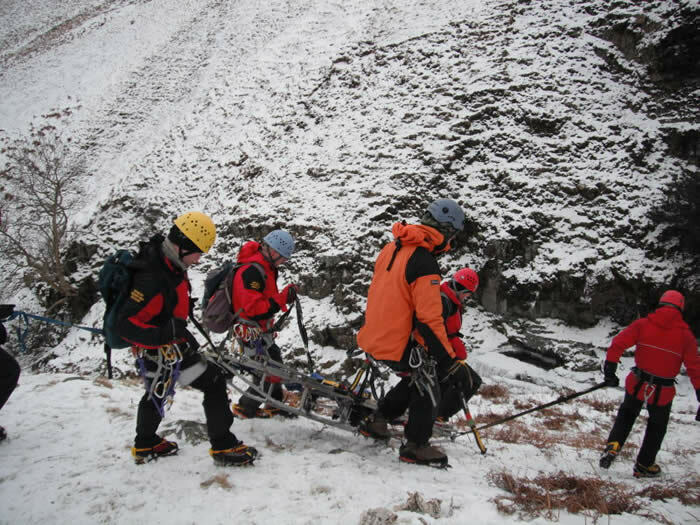 The casualty was an 8 year old girl who had been sledging and had a broken her femur (ouch! – a major and painful injury). She didn’t even cry – an example to many of us. 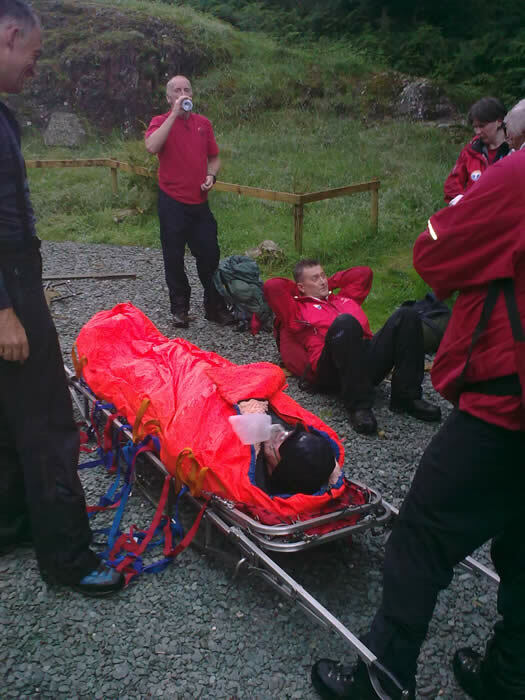 We managed to drive one of our Land Rovers to her, put her in our vac mat (this is basically, a full body splint) and stretchered her to the waiting ambulance. 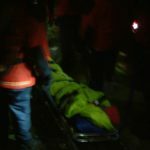 Due to the slippery conditions, the ambulance was then escorted back to the main road . 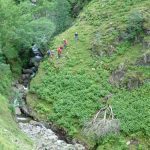 The Police paged the Team following reports of a fallen climber at Cautley Spout in the Howgills and the Kirkby Stephen team was also asked to attend. 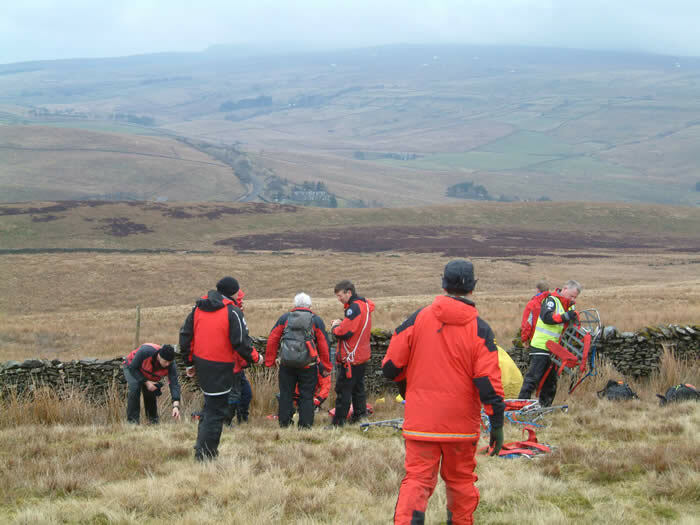 The North West Air Ambulance was tasked and team members from Swaledale, Teesdale and CRO who happened to be in the area assisted. 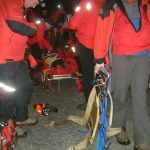 It transpired that the climber has fallen while leading on a climb of the frozen waterfall, sustaining multiple injuries. Very sadly, and in spite of rigorous attempts by the paramedic to revive the casualty, he was pronounced dead at the scene. 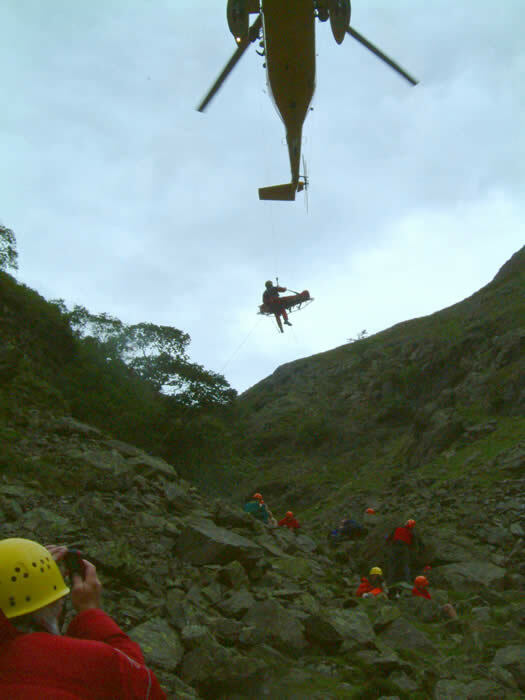 In view of the difficulties and dangers associated with recovering him from the gorge below the waterfall, an RAF Sea King was requested and he was winched up into the aircraft. 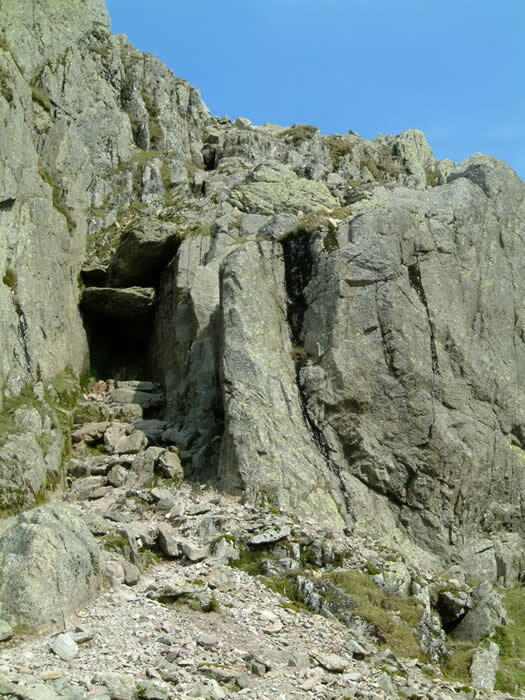 His body was taken to the Westmorland General Hospital. More heavy snow! 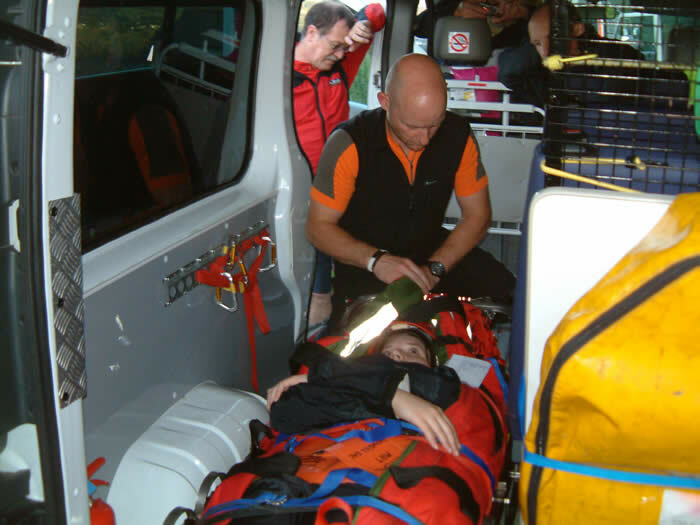 We were asked to assist the North West Ambulance Service to transport a patient to the Westmorland General Hospital.